Discover the literary history, friendly people, and welcoming pubs in Dublin, Ireland’s largest city and its capital. 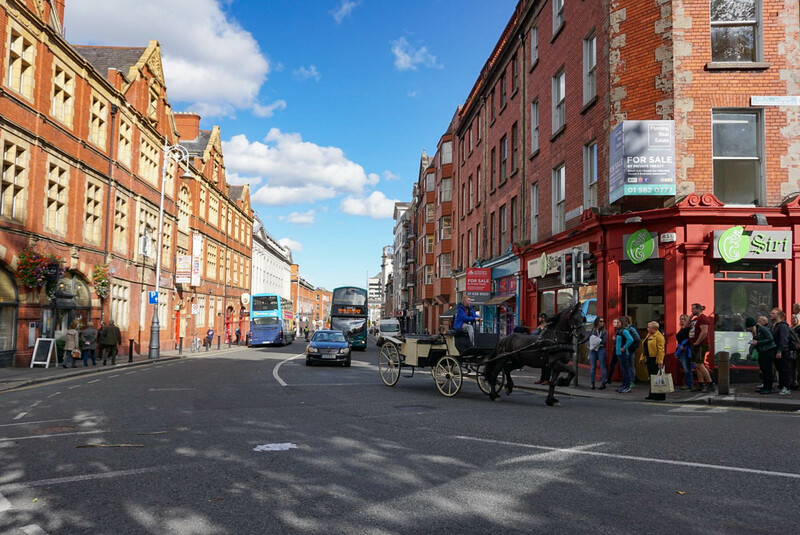 Dublin’s rich heritage and cheerful atmosphere make for the perfect destination for all travelers, especially for those on a budget. 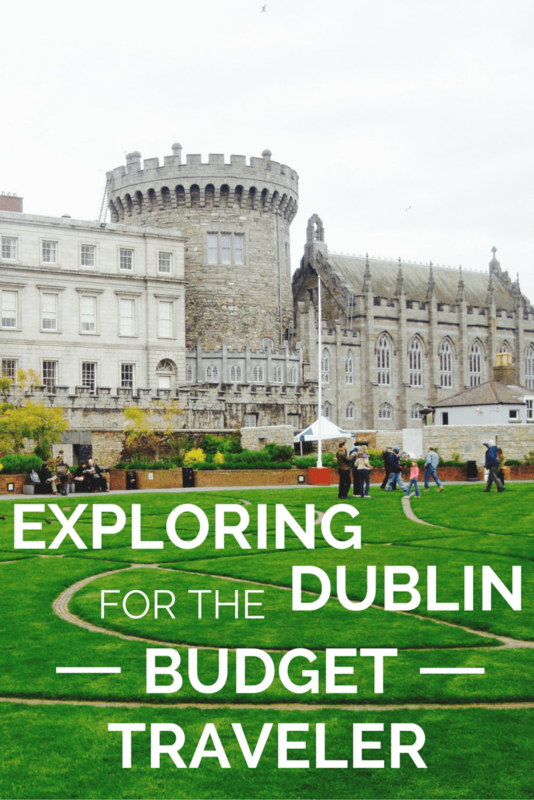 Dublin budget travel is absolutely attainable. To begin with, getting into town from the airport is easy and affordable. I booked my Aircoach ticket online for just €6, and it was a quick and nearly direct route into the heart of the city. Dublin will be kind to your wallet if you plan strategically and use the following tips for affordably visiting this Irish city. This majestic landmark in the heart of Dublin has been around for over 800 years and formerly served as the seat of British rule in Ireland. It was built on a site previously settled by the Vikings, and it is now host to a variety of government leaders while also serving as a major tourist destination. Dublin Castle is free to roam about the exterior, but you can see the interior and learn more about the castle’s interesting history on a self-guided or guided tour. Student, senior citizen, child, group, and family rates are also available. There are no longer very many buildings remaining from medieval Dublin, but St. Patrick’s Cathedral is one of the few still around. It’s the largest cathedral in the country and was built sometime between 1220 and 1260. It is truly an immaculate building. From the outside in St. Patrick’s park the exterior itself gives you a good sense of its size. To visit the inside, you’ll need to pay the €6.50 entrance fee, but it’s well worth it since there are guided tours offered throughout the day for no additional cost. The guides are so enthusiastic and knowledgeable about the church and they will take you through its entire history. Visitors in September should make plans to attend the Dublin Fringe Festival for two weeks worth of music, dance, theater, comedy, and more. Take advantage of the free performances or purchase a ticket for other performances, which can range from about €10 to €50 per ticket. Take a guided tour of Trinity College Dublin led by a current student at the college. The cost of your ticket includes admission to the Book of Kells and the Old Library, which is well worth it since admission to both of those exhibits will run you €10 – 13 per adult anyway. Your guide will give you an overview of Trinity College’s interesting history and show you around the intimate campus. Then you will end near the Book of Kells exhibition where you will proceed in a self-guided fashion. You’ll still need to wait in line for 15 minutes give or take just to get inside even though you have your ticket already. You’ll end in my favorite part of the whole campus, the Long Room. For my fellow bookworms, this library is the one you’ve always dreamed of visiting. If you are visiting Dublin you are likely to seek out a fresh pint of Guinness, although there is no need to look far. You can walk down just about any road in Dublin and find multiple welcoming pubs. Check out the Brazen Head if you’re looking for a pub with a long history, as it is the oldest pub in Ireland dating all the way back to 1198. Alternatively, you can head straight to the source and visit the Guinness Storehouse where the beers are brewed. Purchase tour tickets online for a cheaper rate and to avoid lengthy lines to get in. And of course there is a complimentary pint of Guinness included! A trip to Dublin just wouldn’t be complete without a visit to the Jameson Distillery. On my most recent visit here I was pleased to discover they remodeled and updated their entire tour, so it was even better than my first experience. You’ll learn about the entire whiskey making process in a fun and interactive manner, and the tour concludes with an exclusive whiskey tasting. There are different tour options, so you could take yours to the next level if you decide to upgrade. Definitely allow extra time to hang out for a drink before or after your tour at one of their inviting bars. You do get one drink included with your tour ticket, but they also have other appealing options for those (myself included) especially enthusiastic about whiskey. As a popular tourist destination, there is no shortage of lodging in the city. It is easy to find great deals on hotels in Dublin if you do some research. I’ve stayed at both The Morgan boutique hotel and Temple Bar Hotel, which are right in the heart of the (tourist) action. They’re not the cheapest options, but they are on the lower end for their location and you can occasionally get a really great deal depending on the time of year. Keep in mind, both of these can get quite noisy into the night because they are situated along a very busy pub street. So you may want to look a litter farther out if that’s not your scene. For another prime location in a four-star guesthouse, try Waterloo House. This Georgian style bed and breakfast is centrally located only a few blocks from St. Stephen’s Green and will make you feel right at home. If you book early enough, check out some of Dublin’s Airbnb options as well (use that link for $40 your first stay!). With activities and events suited for every traveler, it comes as no surprise that Dublin has been known as one of Europe’s greatest cities since the 18th century. It has also made Dublin budget travel possible. Beautiful scenery, strong literary ties, a prominent pub life, and a deeply ingrained history that is still significant today, Dublin is a multifaceted city that holds a prime spot on the top of every traveler’s list. As a student I’m always on a budget! Thanks for these great tips! I really hope that I visit during the Fringe Festival, I work at the one here in Toronto and am a complete lover of the arts! It’s a great opportunity to see some interesting performances and having to pay very little to nothing at all! Glad you found these helpful, happy travels to you! I am yet to get to Dublin… and when I do I’ll be sipping back those beers for sure. The best first stop upon arrival is the pub! We were hesitating this year whether to see Dublin or Vienna and decided on Vienna in the end, but I do hope I’ll get to see Dublin some day. Thanks for all the tips and great photos! No problem, I hope you get in a visit to Dublin soon! Happy travels! I love your tweets and your blog. I plan on using this blog to plan out future trips! Glad to hear it Lauren, happy travels! Your pictures are amazing! Thank you for including prices. Amazing job!